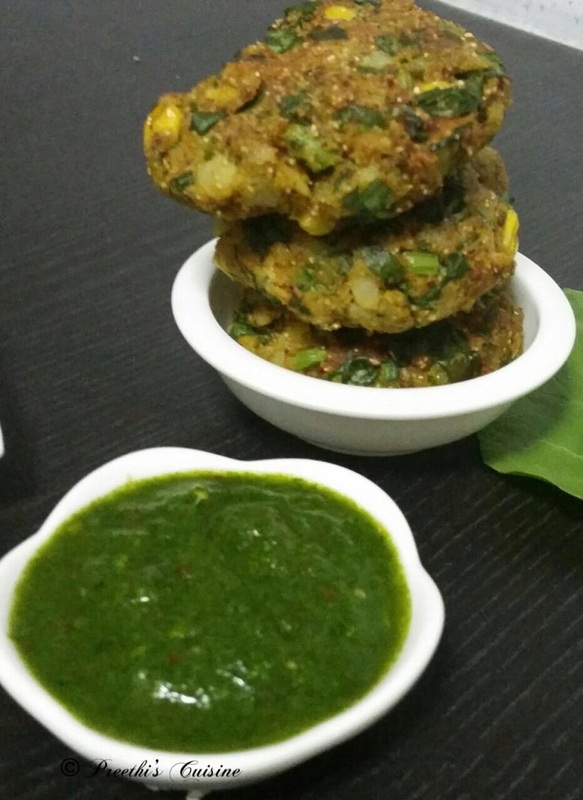 Pesh hai dil se dilwale tikki.Totally guilt free and power packed as it is baked. 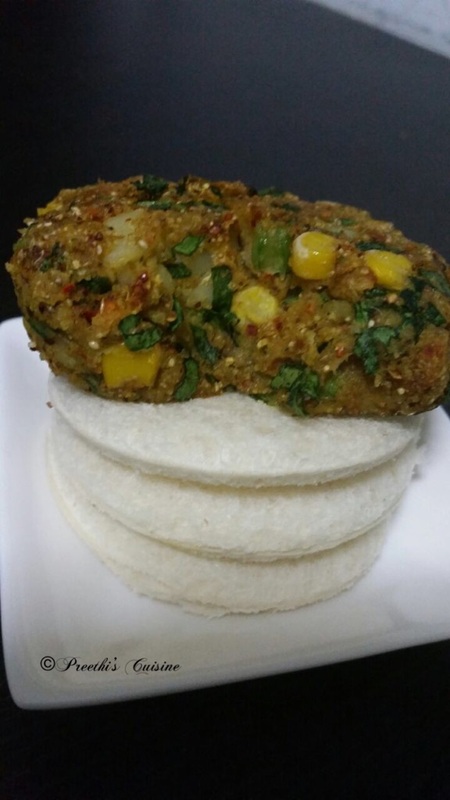 Flaxseed ,Quinoa,Finger millet,Palak,Potato,Corn…Is it not power packed?? 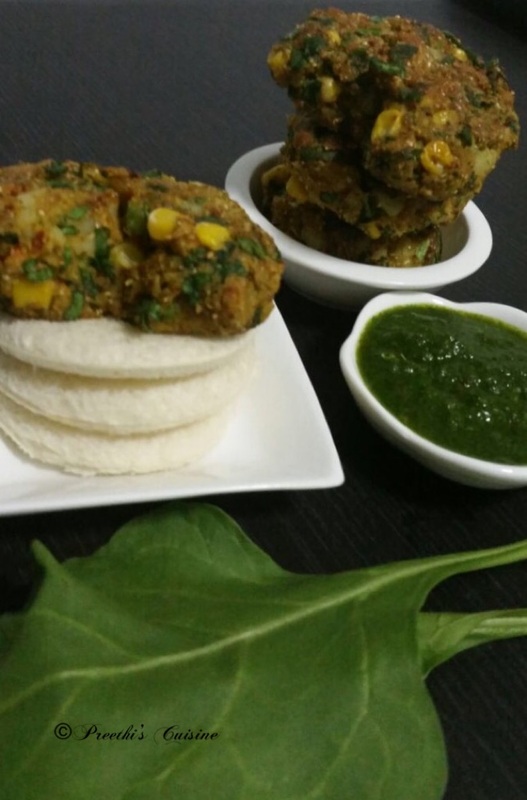 With hot and spicy coriander chutney. You can either bake it or shallow fry. the sides of 3 slices of bread as the round centre portion is used as the base in the photograph. Mix all the ingredients and shape it as desired.Grease the top of the tikki with a little ghee. Pre heat oven at 200C for 10 mins. Grease the tray and place the tikki and bake it for 20 to 25 mins. You can present this to your kids as mini burgers too. As i have added flax seed ,Quinoa and ragi it is better to eat when hot. In case you want to keep it for a longer time it is better to shallow fry. PS:Ragi ,Quinoa and flax seed powders i make it in small quantities and keep it handy. Blend all the above ingredients together and serve with tikki. looks just so healthy and fabulous.. wow.. can i have some please? Thank you Fareeha. You can have all of them. Thanks a ton Roy. Glad you liked it. These patties look AMAZING, and I love that sauce!! Thanks for sharing this simple yet amazing recipe! As you rightly said.. It indeed is so power packed.. Very healthy .. This looks yummy. With some of that green chutney it would be a lovely snack.